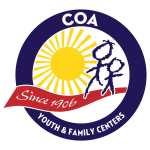 COA Youth & Family Centers Awarded $15,000 Let’s Play Construction Grant From Dr Pepper Snapple and National Non-Profit KaBOOM! The grant is part of Let’s Play, a community partnership led by Dr Pepper Snapple to get kids and families active nationwide. Each year at this event, COA recognizes two Milwaukee couples for their outstanding leadership in the community and their commitment to family.